Angela Meyer, editor of The Great Unknown and author of Captives, a collection of flash fiction which I’ve been reading on and off on the Kindle in my handbag. Flash fiction, or micro fiction, is ideal for handbag reading. (How do men manage to have a book always with them, if they don’t carry a briefcase or backpack??) If you’re not familiar with it, check out Sue’s piece at Whispering Gums but suffice to say that very short pieces of intriguing fiction are perfect for that ten minutes when your friend is late to the coffee shop or you’re in the dentist’s waiting room. Shorter even than short stories, Angela’s pieces are all unsettling forays into a world where Bad things happen. Or they might. At any moment. As the name suggests, all the characters in the collection are captives in one way or another, tucked into ‘chapters’ that all but one are binary opposites: On/off, Up/down, In/out, With/without, Here/there, Then/now and, odd one out, Until. The layout of the book (even on a Kindle) contributes to the reader’s pause for reflection – with white space around the stories and moody graphics like the one you see on the front cover. Concise as they are, the stories pack a punch, and you find yourself stilled into a moment beyond the everyday, feeling a deep sense of unease. One story unnerved me more than most. ‘Thirteen Tiles’ is an everyday situation, where a freak happenstance traps a character in the most mundane of environments, unlikely to escape. Likely to die. I thought I was only claustrophobic underground, but now I know differently! If you’ve ever met Angela, (as a well-known literary journalist and editor she’s out and about at all sorts of literary events) you will know that she has a vibrant personality. The room lights up when she’s around, she sparkles like classy champagne. So I am intrigued by her preoccupation with the macabre (and will be exploring this at the Stonnington LitFest). Where does this come from, this fascination with the noir, the creepy and the eerie? There are no vampires or ghouls in this collection, but there is horror of a different sort, signalled by the very first story: a bride-to-be in ‘The day before the wedding’ finds her lover at a duck-shoot on a marsh and finds that he is not who she thought he was. Still her love had the gun trained on her, and she stood, and even when he lowered it and his expression revealed play, a joke, she knew she’d seen his true face. And that is where the story ends, leaving the reader feeling the same shock as the would-be bride, and pondering the same dilemma. The same doubts: how can one get it so wrong? How can one get in so deep without knowing, until it’s almost too late? Is it too late already? In the white space of the page, the reader’s mind races off in all directions in cold panic, dredging up images from endless tabloid reports about violence against women … is it already too late? Is this one of those charming men that turns out to be unwilling to let go? Is there something I don’t know about in my relationships, that I should have known?? How has this author done this with such chilling economy of words?? 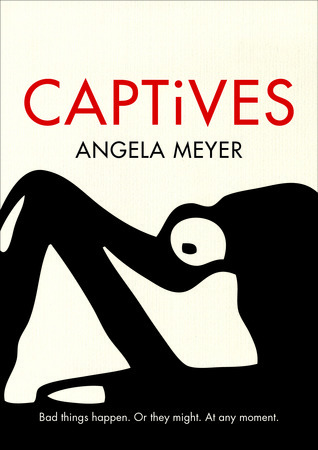 Captives was one of the most eagerly anticipated books of 2014 and has been widely reviewed. You can find links to the best of them on the Inkerman and Blunt website. Personal library, purchased from Amazon. Direct from Inkerman and Blunt or your favourite bookstore. PS If like me you love to write on beautiful paper, Inkerman and Blunt are releasing two Writers Notebooks in time for Christmas. Perfect for my reading journals, yes! They will be available in November. See here. Hi Stu, thanks for dropping by – I like it too – it’s unusual! Thank you so, so much, Lisa. I’m really looking forward to the panel. Don’t worry, Sue, I know exactly what that’s like. I’m only having a brief reprieve myself and don’t expect to be very active once things get difficult again…. Thanks Lisa … I guess we all have patches, don’t we.